GREEN BAY, Wisconsin, August 24, 2011 (ENS) – An award-winning documentary, “The Return of Navajo Boy,” a Navajo family history involving houses made out of uranium and a long lost boy, was a featured presentation Tuesday at the Tribal Lands and Environment Forum in Green Bay. 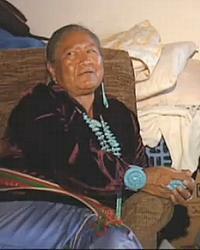 Made in 2000, the film and public engagement campaign are credited with triggering a federal investigation into uranium poisoning, pressuring changes in federal legislation, and after a decade of persistence, inspiring the U.S. EPA to clean up uranium contamination at the home of Navajo grandmother and activist Elsie Begay. Spitz raises awareness through the media, websites, and live events through Groundswell Educational Films, the Chicago-based nonprofit he co-founded. Groundswell enables Navajo activists to video the cleanup and travel around the reservation educating peers on uranium health issues. The forum is an annual national gathering of tribal professionals and their colleagues from federal agencies. Topics on the agenda include waste management, brownfields, Superfund sites, underground storage tanks, land remediation and emergency response. Tribal Forum organizers invited Groundswell Films and Navajo activist Mary Begay to present the keynote address at the Forum. Groundswell brought in attorney John Hueston, formerly the lead prosecutor in the Enron trials, to discuss “potentially responsible party” lawsuits involving major corporations and their environmental legacies. On behalf of the Navajo Nation, Hueston successfully negotiated with GE and then pursued Kerr-McGee, resulting in more than $20 million in new funds targeted for cleaning up Cold War era uranium contamination in the Navajo Nation. The 27,000 square miles of the Navajo Nation contain the largest uranium deposits in the United States and more than 500 abandoned Cold War era uranium mines. According to the U.S. EPA, these abandoned mines continue to contaminate land, water and homes and impact the health of residents. In the 1950s through the 1970s, the U.S. government failed to warn Navajos about the dangers of uranium mining and radioactive waste although the government was the sole purchaser of all the uranium produced on Navajo land. In 1990 Congress passed the Radiation Exposure Compensation Act, which apologizes and acknowledges the United States’ failure to warn three groups of victims: uranium miners, on-site atomic test victims and downwind communities exposed to fallout from the atomic bomb tests. 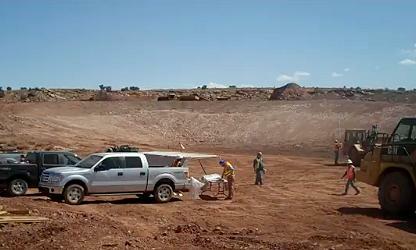 In 2005 the Navajo Nation became the first indigenous government to ban uranium mining and exploration on its lands. In 2008 Congress authorized a comprehensive five-year plan to coordinate the cleanup of contaminated structures, soil and water in the Navajo Nation. This summer marks the fourth year of the cleanup. In April 2011 the EPA began its cleanup operation in Monument Valley at the abandoned Skyline Mine which contaminated the homesite of the Navajo family featured in “The Return of Navajo Boy.” Forum attendees viewed a new “webisode” about the cleanup now underway in Monument Valley.